On March 15, the Toronto Maple Leafs were mired in a season-turning five-game losing skid and fans and media alike were starting to criticize the team. But there was one voice of encouragement coming from another sport. "Hate reading the negativity towards the Leafs," Toronto Blue Jays catcher J.P. Arencibia tweeted to his 70,000-plus followers. “Guys play to win, try not kicking them when they are down, but pushing them to finish strong." 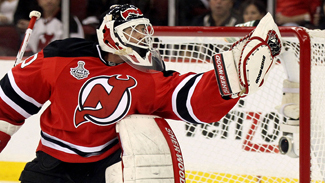 Despite having seven picks at the 2012 NHL Draft, the Devils decided against selecting a goalie. It's obvious the organization believes Martin Brodeur's future replacement already is in the fold. For Arencibia, it was the perfect opportunity to show his support for the Leafs and demonstrate solidarity among Toronto's athletes. The Leafs snapped their losing skid that night and Arencibia earned the respect of several NHL players, many of whom he already considered good friends. And Blue Jays players don't mind staking their claim as the unofficial baseball team of the NHL. "I would say we have to lead the league in NHL players [in the clubhouse]. And fighters -- Colton Orr and [Brian] McGrattan come through," Arencibia told NHL.com. "So we have some big guys we can keep in the dugout just in case anything goes wrong." The bond between the Jays and NHL players starts with the high number of Canadians, especially Torontonians, in the League. But there's also a mutual admiration that exists between all athletes, especially those who have dealt with the grind of hockey and baseball seasons. "The relationship we have with those guys is great because we understand each other's sports. We like hockey and they like baseball," said infielder Brett Lawrie, the only Canadian on the Jays roster. "We even had a hockey fantasy league in the room. I didn't do so well, but I tried my best." With the thick of baseball's regular season taking place during the NHL offseason, Blue Jays players are used to getting tweets or text messages from hockey players either coming through Toronto or training in the area over the summer. A quick scan of the Twitterverse is all it takes to see how most of these social interactions are arranged through Arencibia and Toronto pitcher Ricky Romero. Arencibia grew up playing roller hockey in Miami before befriending some members of the Nashville Predators while attending the University of Tennessee. For Los Angeles native Romero, his introduction to the game came by meeting some of its best players. "Logan Couture and Teddy Purcell were just with us the other day in Toronto. It's awesome to see other athletes support us. And obviously we support them," said Romero, whose newfound interest in hockey came full circle this summer when his hometown Los Angeles Kings won the Stanley Cup. "I had a chance to become good friends with Drew [Doughty]. To see them be able to win a championship in L.A. is awesome." In the days following the Cup win, Doughty's love for his hometown Jays was on full display -- he wore a black Toronto baseball cap at numerous public events, including the Kings' victory parade and an appearance on "Jimmy Kimmel Live." And he's not the only NHL player who is more than happy to show his love for the Blue Jays. "The relationship we have with those guys is great because we understand each other's sports. We like hockey and they like baseball. We even had a hockey fantasy league in the room. I didn't do so well, but I tried my best." "I've got home plate dirt still from the [Blue Jays'] World Series win. It’s in my garage back home. My dad yelled at me to go grab it," New York Islanders forward Matt Moulson said. "I always loved the Jays and loved going to the games. A couple of guys on our team are big Jays guys. I think just being guys from Toronto and Canada, it’s our only team to cheer for. They get a lot of support from the NHL." The Jays-NHL relationship culminated in the team's Canada Day game against the Los Angeles Angels of Anaheim. With a number of NHL players in Toronto for the day, Arencibia and Romero set aside close to 15 tickets for NHL players, who all met up afterward for dinner. "They're good people, so people like to be around them. It's just cool to get an opportunity to meet other athletes and be buddies with them," said Purcell, who didn't hesitate to take a couple of friendly jabs at his baseball-playing buddies. "Those guys are kind of like jersey chasers a little bit." Like any good friend, Romero could only laugh when told about Purcell's comment. "He would say something like that," he said.